Pillow style memorials are a low profile cemetery marker. The higher back slopes to the lower front. In most cases, the pillow markers slope is either 8″ in the back to 5″ in the front or 6″ in the back to 4″ in the front. Available in various shape and sizes. Cemetery regulation dictates the maximum size allowed. Nearly always installed on a granite base – raising the stone from the ground and helping to protect the stone from mowers. Pillow markers, like all of our granite memorials, can be produced in a variety of different colors. 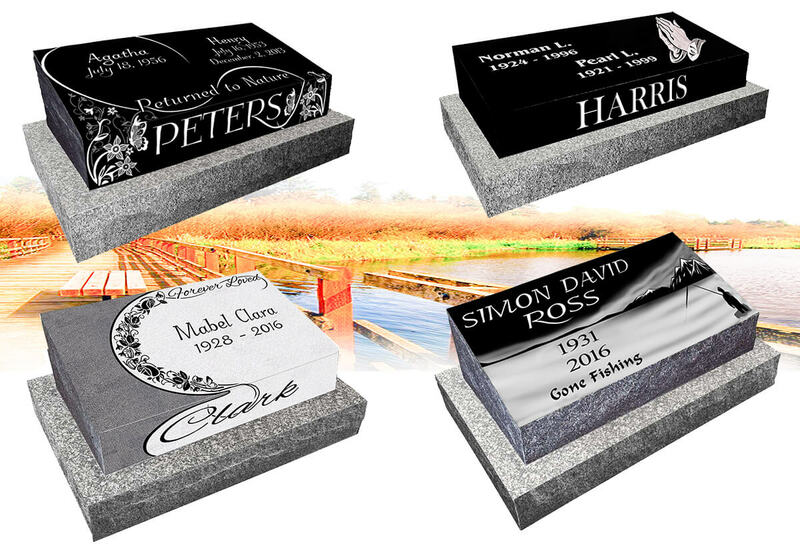 Please contact us for more information regarding Pillow Style Gravestones. Our family highly recommend Carl at Meadowlark Memorials. At a time of grief, Carl was sensitive, caring, prompt and gave us valuable advice. We would not have found the perfect site and memorial to our parents without him. We told Carl what we envisioned in a memorial and he had the exact stone. He worked daily with us to find the right font and design. He is a true artisan. His engraving is a work of art. The memorial is more beautiful than we imagined. Words of thanks are not enough for his amazing work and his caring spirit. With his intuitive and artistic guidance, Carl was instrumental in the outcome of two headstones that look great and exceeded all our expectations. So grateful to have found Meadowlark Memorials……the word is out. Very happy with our Flat Markers we ordered. Carl Hughes was just awesome to deal with….so helpful, kind and recommended some really good ideas. Overall experience was very good. Definitely, recommend them….thanks to all!